Astro Ranch 3A256A is a spacious ranch home with over 1900 square feet of living space. 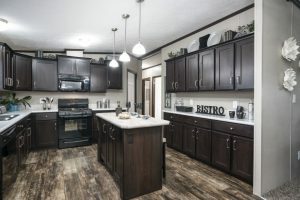 The 3A256A ranch features three bedrooms, two bathrooms, and two separate living spaces. A spacious and open foyer space greets you as you enter the home. The foyer is open into the eat-in nook space as well as the Great Room. The eat-in nook off the Kitchen is a perfect space for your dining table and family meals. Commodore Homes knows the importance of a well-designed kitchen. Kitchens become the gathering point of a home, and the key to a great kitchen are the cabinets! The kitchen features our Classic Craft Custom cabinetry in Vermont Maple Mission style. Classic Craft Custom cabinetry are built to look great, built to meet your needs, and built to last. Our Classic Craft custom built cabinets are KCMA approved, meaning they constructed to the rigorous standards of the Kitchen Cabinet Manufacturers Association. While the cabinets are built to last, they also look amazing. The kitchen features a great layout, including the optional center island. This kitchen has great prep and work space along with storage space. The Kitchen countertops are Lecha Vesta by Wilsonart, and the backsplash is a 4”x8” White Water ceramic tile. The first of the two living spaces is the Great Room, upon entering the home the big open space is inviting and has many different furniture layouts available. The Master bedroom is off the Great Room and is a nice sized master. A large walk in closet and an attached bathroom are features of the master bedroom. The bathroom features a standard tub/shower with options to upgrade to many of our optional showers, the optional double lav sinks, a small linen cabinet, a large linen closet, and a closed off toilet area. The secondary bathrooms are both off the kitchen hallway and are very close in size and storage space. The secondary bathroom is also in this hallway, and is a traditional main bathroom with a tub/shower, toilet, and single vanity. The utility room is next door with washer & dryer hookups and an optional linen cabinet, the furnace cavity is also here. The second living space is a large family room at the end of the home! 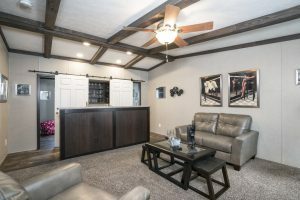 The family room shown in our pictures and our video is the optional Family Retreat, which separates the room into a family retreat space, and a playroom. 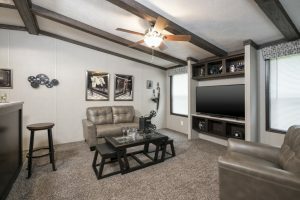 The family retreat has many uses, it is set up as a tv room, with a bar top counter, a beverage center, and entertainment center. Behind the counter are two sliding barn doors that cover the openings of the playroom entrances. The playroom is a nice space with built-in entertainment center, and storage shelves, perfect spot to hide the toys! When the playroom is open the sliding barn doors cover the beverage center! This entry was posted in News on March 22, 2017 by hshearer@commodorehomes.com.